We all know the good weather is never guaranteed for long! When the inevitable happens make sure you’re prepared with our brilliant Avesta waterproof hooded jacket. 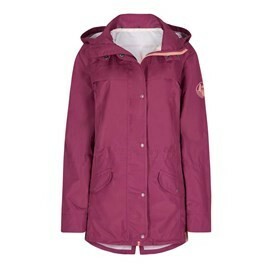 We have designed and produced a clever waterproof jacket featuring a breathable coating and taped main seams, combining them with quirky styling throughout. Choose our Avesta waterproof hooded jacket to keep you dry and comfortable during those wetter weekends, flip up the hood and get out there and enjoy yourself regardless of the weather! Generously sized to fit over layers, lovely style and features. Love it! Used size chart which was accurate as the jacket fitted perfectly. Very pleased with the light weight jacket and now just hoping for rain so that I can wear it! Unusual colour but very nice. Fit is perfect and true. to size. It isn't lined so quite thin but will be good for spring through to autumn. Very happy with purchase.